Use this MoreBeer.com Promo Code and Save $30 On Your Purchase! MoreBeer.com Promo Code Details: Save $30 On Your Purchase! MoreBeer.com Coupon Code Description: Use this MoreBeer.com Promo Code and Save $30 On Your Purchase! MoreBeer.com Coupon Code Description: Today at MoreBeer.com save 15% on stainless steel quick disconnect and quick connects for your home brewing gear! GreatFermentations.com Coupon Description: Well, it is not quite free shipping but it is the next best thing. Order over $50 will ship for just $1 when you use Great Fermentations promo code ONESHIP at check out. MoreBeer.com Coupon Code Description: Save $40 On A 4 Pack of 5 Gallon Ball Lock Home Brewing Kegs at More Beer while supplies last. This MoreBeer promo code is for a set of four used ball-lock kegs and four complete o-ring rebuild kits plus free shipping. Each rebuild kit includes 5 o-rings – one for the lid, 2 for the body connects, and 2 for the dip tubes. These ball lock keg 4 packs ship free, which means a great value for you!A great price on ball lock home brewing kegs. To rebuild the keg you should also consider a new relief valve and poppets. Ball lock corny kegs are approximately 8.5″ Diam. x 25″ Height. 26 1/4″ Height with flare fittings. Measurements may vary slightly. MoreBeer.com Coupon Code Description: Right now at More Beer you can pre-order the all new BrewZilla from RoboBrew and get free shipping! The RoboBrew is an easy to use single vessel home brewing system that can brew 10-gallon batches! The BrewZilla is an all in one electric brewery. These next generation of Robobrew BrewZilla’s comes with various improvements to electronic components and handle design. The BrewZilla features built in brewery heating elements for heating and boiling water and wort. 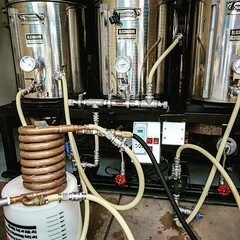 The Brew Zilla also has a built in pump for recirculation, an onboard water resistant control panel for setting and monitoring temperatures, removable grain basket, and a built-in spigot for wort transferring to your fermenter. The compact design of the BrewZilla makes this unit easy to store when not in use. 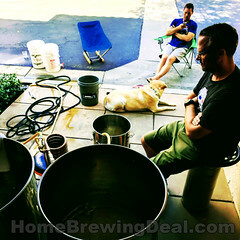 Not brewing 10-gallon batches every brew day? No problem! 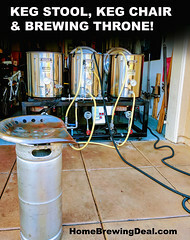 The BrewZilla works just as well for 5-gallon batches, and with so much power, you’ll get your temperatures up even faster. This very capable 15 amp electric home brewery has over 3 kilowatts of power so you can get up to boil in no time.The BrewZilla has been made with ultra-low watt density elements, which means less caramelization and also makes this unit capable of producing very light beers with very little maillard effect. Triple heating elements run off of a single 220 volt plug and have individual switches allowing for more control over the heating process. The elements are 2000, 1000 and 500 watts for a combined 3500 watts! Use all three elements when you need to ramp up the temperature quickly, either to quickly get to your mash temp or to rapidly go from your mash temp to boiling. Use only one of the elements when you want to hold a desired temperature. A built in magnetic drive pump to easily recirculate the wort during the mash. The digital control panel makes it easy to see the current temperature and set the temperature you want. You can also set a delayed start of up to 23 hours in advance so that you can have your water hot and ready to go when you get home from work or get up in the morning. The digital controller is also water resistant so don’t worry about spills or some water dripping down the side. The BrewZilla home brewery also includes a stainless steel malt pipe with false bottom allowing you to easily shift from mash tun to boil kettle during your brew day. 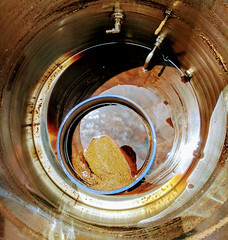 The malt pipe includes a handle to lift it from the BrewZilla and tabs at the base so you can set the malt pipe over the system to let the wort drain out. It also has feet at its base to raise the malt pipe slightly off the base and help prevent clogging. The included stainless wort chiller is shipped with bare ends so you can set it up for your situation.